50-over cricket World Champions Australia are set to take on New Zealand in their opening ICC Champions Trophy 2017 campaign on Friday morning, 02 June 2017. Its a massive game for both sides who are both expected to reach semifinals stage but the losing team in this game will have to win both of their remaining fixtures against England and Bangladesh to stand a chance. While a win for either side will put them in comfortable position which makes it a interesting game. The game is set to be played in Edgbasten cricket stadium in Birmingham and will start at around 10:30 uk time. 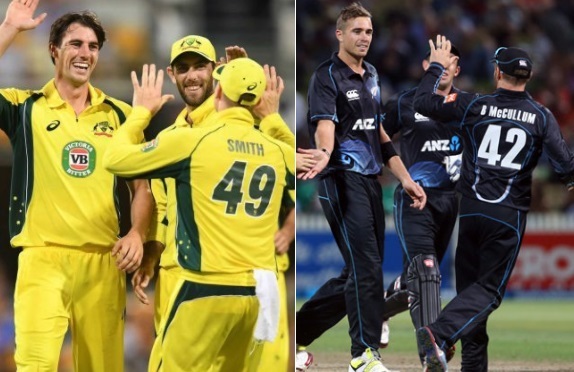 Australia vs New Zealand Short Match Preview: Australia has not played competitive ODI game since early February 2017 and that was the 3-match ODI series against New Zealand which they lost 2-0. Their team lineup will be interesting going into the first match and considering Steve Smith who has tactically savvy captain and he has a selection headech as far as his bowling lineup is concerned. With the likes of Mitchell Starc, Pat Cummins and Josh Hazlewood available, Smith might opt for all out attack and play an extra bowler. New Zealand on the other hand have one of the most balanced ODI team in the world who are improving every year. They key to New Zealand success has been inform bowlers like Tim Southee and Trent Boult who can be lethal in seaming tracks. New Zealand defeated Australia 2-0 in the 3-man series earlier in the year back in February 2017. However when it comes to major ICC tournaments, Australia always had upper hand over their arch rivals. First game of every tournament is important but in ICC Champions Trophy which is pretty much a cut throat tournament, a win in first game can ease the nervous knowing you only need to win one of the remaining two fixtures. While defeat can had severe complications and put the losing team under pressure needing 2 wins in the remaining 2 games to qualify. So a lot at stake on Friday and if weather don’t play any part we can expect a cracking game of cricket. I am going with New Zealand to outsmart Australia in this one.